I present to you one of the most Christmas-y looking cakes on my blog! 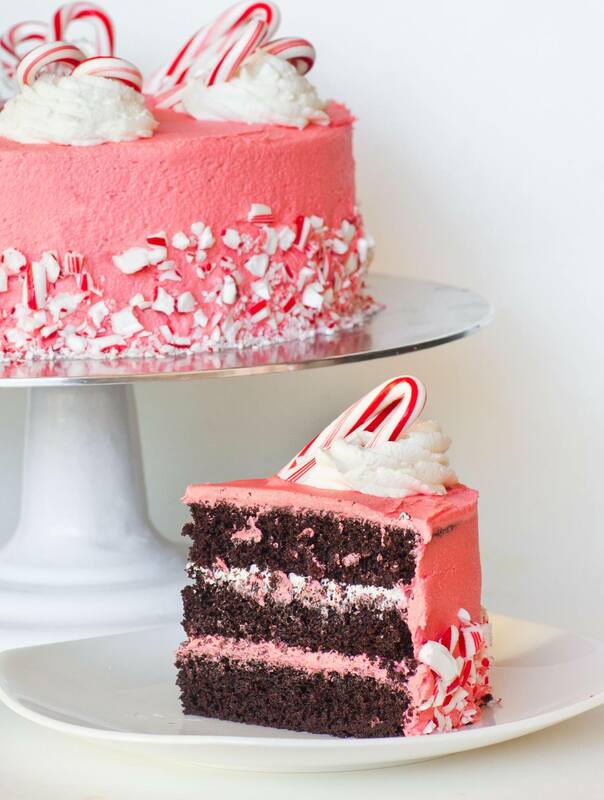 This peppermint mocha cake is minty, chocolatey and candy-cane colored for the holiday season! During winter, one of my favorite drinks is a hot cup of peppermint mocha! So I thought, ‘why not make a cake to capture all those flavors?’! This mocha cake is made with rich and moist chocolate-coffee cake layers. The coffee adds just a light hint of coffee flavor and intensifies the chocolate! I also soak each cake layer with Kahula coffee liqueur for more coffee flavor and to make the cake layers even more moist. The cake is then frosted with a melt-in-your mouth mint buttercream! I divide the frosting into two batches to make one white and one festive red. And to make this cake even more eye-catching, I added crushed peppermint candy to the sides and top. I love everything about this cake, from the festive holiday colors, to the incredible chocolate and mint flavors. Serve this at your next holiday party to impress your guests! Preheat oven to 350F. Line 3, 8-inch cake pans with parchment paper and spray sides with non-stick baking spray. Can also use 2, 9-inch pans. In a large bowl, cream together the butter and sugar until light and fluffy. Add the egg whites and peppermint oil. Whisk the mixture until egg whites are fluffy. Then add the remaining liquid ingredients: coffee and milk. Make sure coffee is cooled to room temperature. In a separate bowl, mix together the dry ingredients: flour, cocoa powder, baking powder and salt. Using a fine mesh strainer/sifter, sift the flour into the cake batter in small batches, mixing after each addition just until combined. Divide the cake batter evenly between the prepared pans. I recommend using a kitchen scale for accuracy. Bake in preheated oven for approximately 40 minutes or until a toothpick inserted into the center comes out clean. Remove cakes onto cooling racks to cool completely. Once cooled, use a long, serrated knife to level off the tops of cake layers if needed. Prepare the buttercream: place softened butter into mixer bowl and whisk on high speed for 5 minutes, until very light and fluffy. Add the peppermint oil and gradually add the confectioner's sugar, mixing well after each addition. Once all sugar is added, continue whisking the buttercream until very fluffy. Reserve 2 cups of white buttercream in a separate bowl, then add red food coloring to the remaining buttercream. To assemble the cake: place the first cake round onto a cake platter and soak the layer with Kahlua coffee liquor. Then add a generous amount of red frosting, spreading it to the sides with spatula. Repeat with second cake layer but use white frosting for the middle layer. Add third layer and frost top and sides of cake. Use a flat spatula to even off the tops and sides. Use a spoon and your fingers to press crushed candy canes into the sides of the cake, if desired. Transfer the remaining white frosting into a pastry bag tipped with a star tip and create rosettes on top of the cake. Top with mini candy canes. Keep cake refrigerated; remove 30 minutes prior to serving. are u sure to use 1000g convection sugar? doesn’t it will be too sweet? Do you have any recipes or ideas for the 6 large egg yolks so they dont go to waste? I only have unsweetened cocoa powder do i use the same amount as dark cocoa powder? Peppermint Buttercream: can i use extract and not peppermint oil? Hi! I don’t have a recipe to use the egg yolks, but this recipe will also work well with 4 whole eggs. I used unsweetened cocoa powder, too; use the same amount. And peppermint extract will be great! 🙂 Enjoy!